I’ve just launched a new blog site at Patreon. Patreon is a new digital community in which artists, writers and other talented folks can share their creations and recruit “patrons” to help support them with small regular contributions. It’s the power of the internet that makes these “communities” so powerful. Not everyone is interested in Pacific Northwest folklore, or yarns – but just enough of you might enjoy a “good” story from the early days of this country to keep this hungry writer churning out the tales that give our culture its unique flavor. Enjoy! To begin with I’m using Patreon to showcase my non-fiction short story writing, but I may expand it to include some of my fictional writing, if readership numbers justify the effort. So if you’ve enjoyed my stories, I urge you to go to https://www.patreon.com/user?u=4906823 and see what I’ve presented for your enjoyment on my Patreon publishing platform. In The Hidden Life of Trees, Peter Wohlleben presents a multi-generational perspective on the “old” forests he manages in Germany. Much of the scientific inquiry that he conducted was done under the aegis of Aachen University (RWTH Aachen). In this book he links his own knowledge and scientific inquiry with recent forestry research coming out of British Columbia, Brazil, Australia, the US and Russia. And the conclusions he reaches are very thought provoking. In this handy little tome, Wohlleben describes the links that synchronize the diverse actions of many trees into a single sentient organism. He methodically examines the resulting behavior of this socially cohesive forest through a variety of perspectives to see if the collective entity shows the essential qualities of sentience. So what are those essential qualities of sentience? The following questions summarize some of the qualities that he examines. Can the forest communicate? Can it count? In the early chapters of the book Wohlleben gives many examples of how trees communicate: through their intertwined root systems, by releasing bursts of scent or by transmitting their conversations along vast subterranean fungal networks. He also describes a well-known phenomenon that causes groups of trees to coordinate their production of fruit or seeds so that they produces a bumper crop of fruit bodies. The large crop of seeds or pine cones overwhelms the herbivores ability to consume the crop – leaving many fruit-bodies uneaten and able to germinate in the spring. In Germany this is called a “mast” year and it is usually followed by a spike in the population of herbivores – since there’s plenty for them to eat. However, in the following year, a dramatic drop in the production of pine cones or seeds causes the populations of deer to collapse. This unique reproductive strategy not only suggests communications between the trees, but also hints at active collaboration, and the ability to count, since these “mast” years do not occur at predictable intervals. Can a forest smell or taste? The notion that trees can signal danger to its neighbors by releasing a special scent is astonishing enough, but it gives rise to an even more remarkable question: can trees smell these danger signals – differentiating them from the usual olfactory background scents. Can a forest learn from memories of prior experiences? Wohlleben illustrates how the spruce drinks up all the available water but later adopts water frugality. He recounts the differing behaviors of two separate groups of trees: One absorbed and transpired vast quantities of water to grow quickly, while the other retained more water and grew more slowly. It had learned the hard way that coming up dry in mid-summer was unpleasant. This change of behavior in response to prior occurrences suggests that trees have the capability to remember and learn from previous experience. Where is this memory held? What part of the tree community makes the decisions. We’re but babes in the woods when it comes to these questions. The forest does not practice the Law of the Jungle. The evidence of Wohlleben’s field observations and the research from his far-flung contributors supports the notion that forests are capable of sharing resources for the benefit of the entire forest community. The Institute for Environmental Research at RWTH Aachen has even found evidence that the trees synchronize their growth despite differences in the soil conditions and access to sun. It seems that they are all photosynthesizing at the same rate regardless of the different growing conditions. Evidently the forest does not live by the law of the jungle. Among trees the strongest make sure that the weakest are equally successful, since a uniformly strong canopy strengthens the entire forest. How does “thinning” affect the forest? What about “thinning” one might ask? Here in the Pacific Northwest trees are seeded quite close together necessitating an initial thinning within a dozen years or so, and then again after 25-30 years. Wohlleben claims this rips at the fabric of the growing forest. He asserts that when trees are thinned that it breaks their communications since their closest neighbors have been removed. This inhibits their abili ty to develop collaborative strategies to share resources and ensure a dense regrowth of the canopy. He even cites a case where “girdled” trees overcame this attempt at strangulation. The neighboring trees made sure to supply the injured trees with enough nutrients and carbohydrates to overcome their injuries. I have found that such “girdled” forests also have a much stronger mycelium layer, suggesting that some of the aid is delivered through the mycorrhizal fungal network. From my experience this active mycelium layer also contributes to the proliferation of mushrooms – a fact that is interesting for the mushroom hunter. The Slow Growth Movement for trees. Wohlleben’s book delves into forest procreation and the symbiotic role that insects play in this complicated sequence of events. He also explores the age-old dilemma of how to avoid inbreeding – a mortal danger for almost all creatures. And then there’s the “upbringing” (Erzeihung) of the younger trees. It turns out that for many trees it is unhealthy to grow too quickly, and the older generation that towers over the young seedlings can enforce their “upbringing” through the simple expedient of depriving them of light. Scientists have determined that those trees that experience a slow initial growth are much more likely to live longer. And then there are those trees that have abnormal shapes, like “pistol grip” trees that grow out of the ground at an angle, but then straighten to grow vertically upwards. In the Alps or on steep snowy slopes this bend in the trunk can be due to the pressure of snow combined with rockfall piled against the pliant trunks of seedlings. In the Pacific Northwest it is more likely due to the very slow movement of the ground. In these cases the tree grows straight, but the slowly shifting soil tilts the seedling, which later bends its growth to regain a vertical alignment. Look along the edges of our ravines to see the struggling “pistol- grip” tree trunks. Down in the basin of the ravine, you can observe the agile alders steady themselves as the ground slips by beneath them. The occasional big-leaf maple will anchor itself along the edges of the ravine. But the fir and cedar prefer to stay on the ridge lines where the earth is nearly stationary – in part, because these trees are prone to tipping over after excessive rain turns the soil into pudding and winds pummel their highest branches. In one particularly good chapter he examines the forest’s hydrology. He points out that the wide expanse of forested land hugging our coasts is responsible for weather patterns as far as 400 miles inland. By clear cutting these coastal slopes we remove the sponge-like quality of these dense coastal forests to soak up the ocean storms that come thundering out of the Pacific. The question of relative timescales. Here in the Pacific Northwest trees can grow to be 800 years old, or older. That’s nearly 10 time the longevity of humans. Does this huge disparity in timescale between trees and humans blind us to the actions of trees? What trees considered an abrupt change, might not even register on our shorter time-frame. An example of this can be found in the current studies of climate-induced tree migration. Studies in Sweden have found that the Norway Spruce has adjusted its growing range 240 meters in elevation since 2002. Changes in altitude are a good proxy for geographic migration because the higher elevation causes temperatures to drop and the growing seasons to shrink emulating the climatic shifts associated with northward migration. However, recent studies have also revealed that instead of “heading north” trees are adjusting to the warmer and wetter climates by increasing the relative abundance of juveniles. These adaptations appear to be speeding up the trees’ life-cycles instead of shifting the distribution of tree populations northwards. Given the enormous differences in our timescales, it may not be feasible to determine whether trees will opt for migration or simply increase their life-cycles. In that lengthy time-scale that encompasses a tree’s lifetime, we may need several lifetimes to appreciate the tree’s perspective. My friend Martin Flatz has a tree like this. The stories about this chestnut tree’s great achievements and disasters are deeply rooted in his family’s oral traditions. It has presided over the annual puppet show for nearly 50 years, and it has seen the comings and goings of owners and refugees for several centuries. Martin’s letters bring news of how it fared in the winter storms. It is a tree of which we might say, it has its own character and has a presence in our lives. Monetization of carbon accumulation in our forests. For centuries we have used the forest as a resource and the only way that we estimated its value was to price it out in terms of the dimensional lumber that the tree could produce. After about 60 years the vertical growth of our forest’s trees begins to slows. Traditionally, when the upwards expansion of the forest began to slow, we would summon the loggers. Older trees grow faster and sequester more carbon than young trees, but this growth occurs at the base of the tree with large bulges oozing down the trunk. But recent studies have shown that growth actually increases as the tree ages. The tree’s growth was not significant in terms of its height. Instead the studies showed that it came from an ever-expanding trunk. “Rather than slowing down or ceasing growth and carbon uptake, as we previously assumed, most of the oldest trees in forests around the world actually grow faster, taking up more carbon,” said Richard Condit. According to this staff scientist at the Smithsonian Tropical Research Institute, “A large tree may put on the weight equivalent of an entire medium-sized tree in a year.” Just like humans this additional girth shows up as bulging growths that cascade down the trunk. Increasingly there is heavy competition for the “free” resources that are generated in our “common areas.” Commercial interests are buying up our water, and fossil fuels are polluting our air. Fishermen, farmers, energy companies, recreational users and Indians are competing for these increasingly scarce resources. Clearly we cannot abide the degradation of our atmosphere and must find a way to regulate demand and incentivize increased carbon retention. These pressures may push us to put a price on these free resources, either in the form of a carbon tax or through a cap-and-trade market. If that occurs, users that degrade our atmosphere or use our water will be obligated to restore these resources to their prior capacity. The most direct way to do this would be to create a market that lets carbon emitters purchase carbon retention credits equal to the resource they used. A carbon tax is another alternative approach to pricing these resources and funding initiatives that increase carbon retention. Mandating some form of compensation for the use of our common resources would immediately change how we perceive and value our forests. The forester would no longer be concerned with maximizing the output of dimensional lumber, but would instead be managing the forest to maximize its carbon retention. Trees would become more valuable as they grew older and increase their carbon absorption. Standing trees would be eligible for an annual carbon credit, that would increase with the size and age of the tree. The creation of carbon retention credits based on carbon retention by trees would turn our coastal forests into a gold mine – as long as producers needed to buy credits to offset their depletion of our “common” resources. If such a market were to be established it would effectively recognize the huge value that our forests create in the form of breathable air, potable water, inland precipitation, and climatic stabilization. Do trees have their own emotional needs? If so, do we accommodate these needs? In the introduction to his book, Peter Wohlleben writes about his discovery that trees can experience pain, and have memories. He describes how their live in groups with parents and children in close proximity. In the forests that he manages heavy machinery has been banned since it is destructive to the flora and fauna and also compacts the soil making it harder for the roots and the mycorrhizal networks to propagate. Throughout Germany trees are harvested selectively, and in the forests that Peter oversees only horses are used. He reasons that this also makes commercial sense since a healthier and “happier” forest is more productive and profitable. Even though we know that trees are living creatures we still categorize them as objects. Should we accord them with rights as we do with other living creatures like pets, and domestic animals? Yet even domesticated animals are slaughtered so that we can use them for our own survival. Why not trees? Is the harvesting of trees a reprehensible activity? Not necessarily, since we too are part of the natural food chain and we cannot survive without using the organic substances provided by our fellow creatures. The real question is whether we use only what we need and otherwise leave the forest alone to grow in peace, without the disturbances of caterpillars, skidders and heavy trucks that thunder through the trees’ pastoral home like the four riders of the apocalypse. Instead we should begin to consider softening our impact on our forests, by reducing our massive clear cuts, by selecting logging, by using horses rather than machinery and above all by letting trees live “in a way that is appropriate to their species.” That means we should recognize their social needs, and allow them to mingle and to pass on their wisdom to their successors. Some should be allowed to grow old, unharvested, until they buckle under the natural furies of the Pacific storms. We’ve come along way in the past century with respect to our treatment of mammals and fowl that occupy niches near us in the food chain. Lewis and Clark ate more than 200 dogs during their two year expedition; today we consider such practices to be barbaric. We raise cage-free chickens, and free range lamp, to say nothing about our monumental efforts to restore the Pacific Northwest fish runs. On Oregon’s Mt. Hood logging is severely restricted in the Bull Run watershed. They log selectively and only when it is necessary, and then they use horses equipped with diapers to avoid introducing external organic materials. Is it really such a giant step from where we are today to a gentler, and kinder forestry – especially if the reward systems are reversed and trees are more valuable as carbon repositories, than as dimensional lumber. When standing timber is more valuable than lumber these changes in forest management will inevitably follow. And the Pacific Northwest will experience a renewable resource boom that will reward us for our forests – since they may be the most effective guarantor of North America’s breathable air supply. Meet your new partners in our effort to sustain the livability of our planet. This book will leave you with more questions than you started with, but it will also make you feel like you’ve been introduced to a new form of intelligent life that’s been with us all along and may hold the key to our survival. I recommend Peter Wohlleben’s book to those fascinated with the forests, or just those looking for new perspectives on our existing paradigms. Happy reading. Occasionally, books come along that change the way we think about the world. Published in 1999, Jared Diamond’s Guns, Germs and Steel was one of those books. In 2016 it happened again with publication of The Hidden Life of Trees by Peter Wohlleben. Even before it was translated into English the New York Times had posted a notice that this obscure forestry book was taking the German book market by storm and being anticipated all around the world. Peter Wohlleben beneath his beeches. 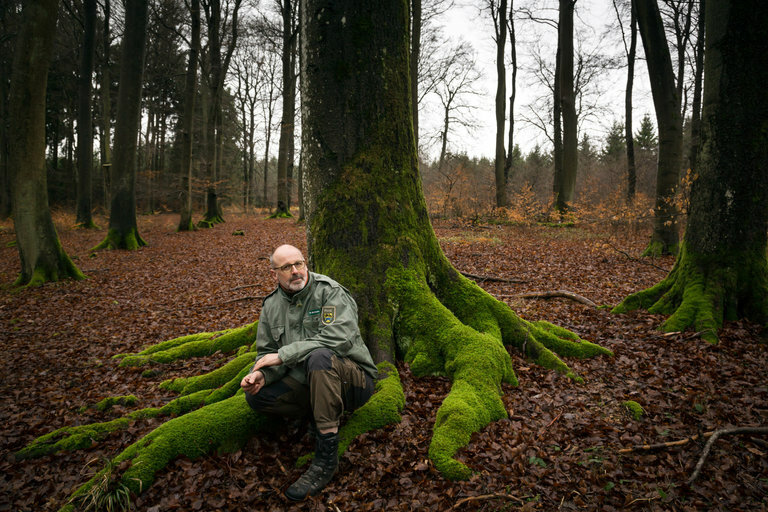 Since the publication of his book, it not only topped the German best-seller list, but is now climbing up the US best-seller lists enchanting readers who would normally never consider reading a book about trees. Ever since its release, Mr. Wohlleben has been asking his readers to reconsider the true nature of trees. They’re more than just a source of building materials. They’re a community of beings that look after each other with all the tenderness and foresight we attribute to mammals. Are we failing to see the forest for all its trees? Trees grow without blocking sunlight to their neighbors. Much of modern forestry has focused on optimizing the production of trees as if they were asparagus that grew in complete isolation from each other. Recently foresters have been shifting their assumptions about forestry from a focus on the individual trees to focusing on the forest as a whole. Scientists are realizing that “most individual trees of the same species growing in the same area are connected to each other.” It also seems increasingly clear that this community of trees actively collaborates as it goes about safeguarding the resilience of the forest. Wohlleben, speaks from his experience as Germany’s expert forester, assigned to the country’s oldest forests. He reports that these old trees (mostly beeches) develop sturdy branches only on the far edges of their canopies.” They appear to be avoiding direct competition with their neighbors. Notably, he also reports that younger plantation forests seem incapable of networking with each other to optimize the use of existing sunlight. “A tree is not a forest,” Wohlleben asserts. They do not live in isolation from each other. Trees, in their collective guise as a forest, have the ability to change their ecosystems by moderating extremes of temperature or turbulence. In this environment trees have been known to live extremely long. But to sustain such a balance the forest must remain intact, no matter what! If the forest can achieve this, Peter Wohlleben predicts that the trees will be happier, more productive and live considerably longer. by passing resources through the mycelium layer that lies under the forest floor. Failure to protect the integrity of the forest canopy typically produces holes that permit turbulence to rush in and cause damage. So if we accept the idea that trees collaborate, it’s not surprising that they will concentrate their resources to repair these holes and restore their protected ecosystem. This community-centric organizing principle contrasts sharply with the Darwinian paradigm. It’s not about the survival of the fittest, but the survival of the community. In stark contrast to “Jungle Law,” trees will seek out the frailest of their kind and nurture them until the weakness has been repaired and the forest ecosystem is restored. Survival results from collaboration, not direct competition. Commercial clear cutting, the way we experience it here, is entirely different than the selective logging approaches used in Germany. Here we strip whole mountainsides, and denude complete watersheds. Afterwards we reseed the clear cuts. But in Peter’s experience these “plantation trees” have no ability to communicate or engage in collaboration. The mycelium under the clear cuts has not regenerated, and the underground network of living roots has been severed. Even the trees’ ability to cast off distinctive scents is useless since the nearest living neighbors may be more than a mile away. To make matters worse, we plant only a single species making the resulting forest vulnerable to environmental catastrophes. After a clear cut the forest goes silent on all channels. When after 50 years, their replacements begin communicating with each other on the slope, they’re once again chopped down. Measured against the millennial life span of our Pacific Northwest old growth trees, these plantation trees are harvested when they’re still infants. The Klootchy Spruce down on the Necanicum was said to be 750 years old when it finally succumbed to the elements. Given that longevity 50 years is just 6% of the tree’s natural lifespan. So it’s no wonder that the plantation trees haven’t learned to communicate with the surrounding forest. Measured in terms of human lifespans they would be about 5 years old when they were harvested. It could take generations of trees to rebuild the communications skills Wohlleben observed in the ancient beeches he studied. It depends upon who you’re asking? Wohlleben contents that the trees in the forest are constantly in touch with each other, and they would certainly know if any of them fell down. To document his assertion that trees are in constant communication with their neighbors he cites the Acacia trees in Africa, which change the chemical composition of the fluids they pump through their canopy when they detect the presence of predators like the giraffes. The acacia trees also release a flush of scent molecules that effectively warn their down wind neighbors. The up-wind neighbors get their slightly slower tip-off to the lurking danger via the root tendrils and the mycelium network. Research at the University of British Columbia has established that these signals are travel at a rate of 3 minutes per inch. At this rate the surviving neighbors 100 feet upwind of the clear cut would learn of their neighbors’ demise about 60 hours after the Husqvarna’s were fired up. Even if they didn’t feel the thundering crash of the big giants, the surrounding forest certainly learned about it very quickly. In fact they may have even “heard” it. Recent studies at the University of Western Australia, have revealed a noisy conversation among the trees at a frequency of 220 Hertz. Perhaps, this is the wavelength which trees use to communicate, like the truckers that communicate across a predesignated CB radio channel. The forest heard the falling tree, and now they’re all abuzz about it. Perhaps it’s to dramatize the purposefulness of the trees’ actions, or maybe it’s just to engage the readers, but The Hidden Life of Trees does tend to anthropomorphize the forest. Admittedly, this dramatization can be a bit off-putting. But maybe it’s these “humanized” sensibilities that make the book so dramatic and keep us invested in the fate of Peter’s forests. Despite these slightly kitschy embellishments, the book is a “real page turner” delving deep into new research and pulling all the threads together to describe a collective sentience that operates on a time scale that makes their actions almost invisible to us. Every year Peter and Pam celebrate the cold damp miserableness of Oregon’s winter. It’s the kind of sloppy coldness for which Oregonians hold an especially sodden place in their hearts. When I arrive at the rendezvous and park under the conifers lining the dirt road, I remind myself to pull my hat down over my head before stepping out of the car. The one time I neglected to give due deference to the snowy sculptures suspended overhead, a big melting parapet toppled neatly over my pate and ran down my neck with a cold rush of icy water. It’s a rite of winter to join Peter and Pam as they celebrate the dumping of coho salmon carcasses into the little creek that runs along the back of their property. Invariably there are a gaggle of kids from Catlin Gable or elsewhere who’ve come to share the raw midwinter experience and eat some of Pam’s delicious chili. Outside, ringed around the blazing fire, are people from all over. I know some of them, others I recognize but can’t associate with a name. Maybe they had kids at Catlin when my kids were there, or maybe I know them from my trail advocacy work, but in any event I am surprised to see them here at this special seasonal rite. I feel like going over and asking how they knew about this event, this secret forested cabal, where we sacrifice coho cadavers along the banks of Lousignont Creek. One year, Neal Maine, one of the founders of the North Coast Conservancy, took us on an excursion into history. Starting near the barky edge of a big circular cross cut section of a big old spruce tree, he proceeded to recount the history of this area pointing out among the concentric circles the lean years and the fat ones. “Here’s where we first arrived in the Nehalem Valley”, he said picking out a ring that might have grown around the middle part of the 19th century. “Lewis and Clark must have passed by on the Columbia around here”, he said pointing to an indistinguishable ring”, a bit further in. “Here’s when Christopher Columbus arrived – albeit a long ways from here”. Tracing his progress back in time he pushed his finger deep into the countless concentric rings encircling the core of the ancient spruce. It was a seedling somewhere around the 13th century he surmised. Locally, the 13th century was and remains an epoch clouded in mystery given how little we know about those early Tillamook Indians who explored the headwaters of the Nehalem River. Those were early days even here, and the Nehalem River was hard to find and harder to follow given its steep banks and thick vegetation. Maybe it was still a pristine forest; still untrodden ground in the 13th century. We may not know much about what went on locally in those ancient times, but it’s likely that these solitary hunters left no more than an occasional footprint among the fern-covered slopes. But far away on the other side of the globe events were taking shape that would eventually end up affecting these remote forests in a way that would be wholly unforeseen. Far away from the damp environs of the Upper Nehalem River, wheels had already begun to turn that would ultimately connect this stream with an ancient tale of conquest, defeat and byzantine intrigue. History has a curious way of knitting people and places together. Lousignont Creek is one of those unusual linkages, a wormhole that pierces through time like a beetle chewing his way to the core. On the surface, Lousignont seems like an odd name in these parts. More typical names of streams are Darby Creek, Carlson Creek, or even nearby Wolf Creek. One might wonder whether Lousignont was part of the metis generation descended from the French voyageurs and their native wives. But no, the origins of this name go back as far as the 12th century, long before the Europeans even knew about the Americas. During the latter half of the 12th century, the de Lusignan dynasty ruled Poitou, a small marshy fiefdom along the western coast of France. Poitou was fervently religious and supported the christian crusader kingdom based in Jerusalem. Upon the death of King Baldwin the 4th in Jerusalem, there was much competition among the crusaders for the hand of his widowed queen, Sibylla. After several byzantine maneuvers Sibylla chose Guy de Lusignan a handsome knight, ten years her junior, who had just arrived in Jerusalem. Thus by good looks and timing Guy de Lusignan became the King of Jerusalem in 1186, reigning until 1192. Following his accession to the throne, there was increased fighting with the Ayyubids, who were loyal to Saladin. In 1187 Guy was captured by Saladin and imprisoned in Damascus. A year later he was released, but he was unable to regain his crown, despite strong support from King Richard the Lionheart. In compensation Guy was made the Lord of Cyprus, where he ruled until his death in 1194. After that rapid rise and fall from power, we see occasional mentions of the de Lusignan family in the Middle East. In France the family had become Huguenots, or French Protestants. These french followers of John Calvin’s teachings soon ran afoul of both the church and state. Persecuted, three de Lusignan brothers fled, setting sail for the French possessions in the South Sea Islands. Despite the idyllic conditions, at least Guy tired of the Polynesian torpor and made his way to Canada. From there we can track Guy de Lousignont to Ohio, where his son, John was born in 1818. During John’s youth he apparently moved to Joseph a rough frontier town in the newly minted state of Missouri. In those days “St. Joe”, as it was called, was the “jumping-off point” for those headed west. He stayed there long enough to marry Delilah Enyart, who gave birth to two girls that apparently did not survive. Perhaps it was this tragic loss that pushed John and Delilah westwards, because in 1843 they decamped into the great western wilderness. Arriving on the eastern reaches of the Walla Walla Valley in 1843, they stopped at the Whitman Mission and tarried awhile with Marcus Whitman – before eventually moving on to Oregon. Records reveal that by that fall John and Delilah Lousignont had finally arrived on the Lower Columbia – as part of the first wagon train to penetrate Columbia County. Once there he acquired some property, but the promise of fertile land just beyond the Tualatin mountains soon drew him into the Nehalem valley, where he built his cabin in Washington County – about as far up the Nehalem River as a canoe can reach. According to federal records, John Lousignont spent most of his years in and near Washington County. His name appears on the voters register for Clackamas County, July 26th, 1845. The creek is actually not named after John. It’s named after his son: Frank Lousignont. Along with his father, Frank Lousignont appears to have been one of the earliest settlers in the valley, hosting new neighbors as they hurried to complete their accommodations before the weather set in and snow made travel difficult. Frank established a claim near the mouth of the creek in 1869 and lived there until 1902. Using his mule to collect supplies in Westport led him to discover an old Indian trail that ran through the valley, along the Klaskanine River, up Fishhook Creek and over the top of the hills and down to the Columbia River. 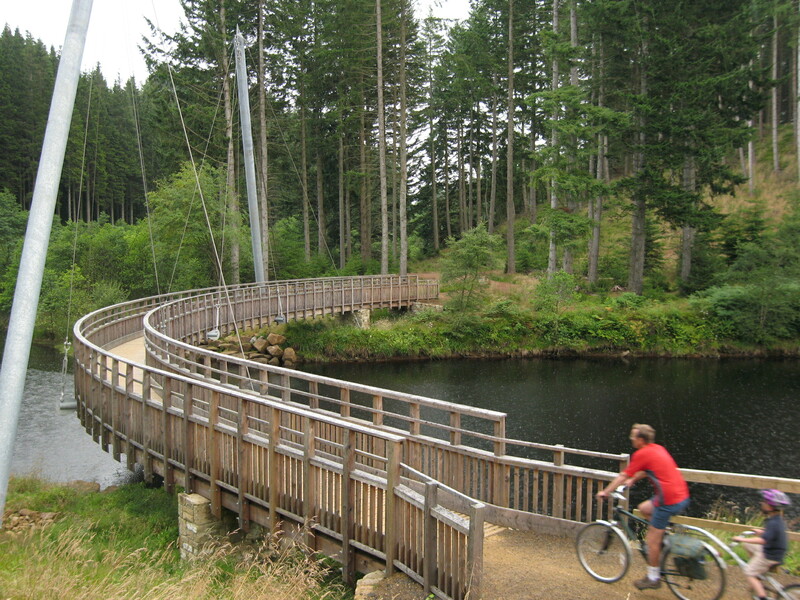 This eventually became the most used trail to access the Nehalem Valley before the days of cars. Although their homestead on the confluence of Lousignont Creek and the Nehalem River no longer exists, the family has flourished with branches located in Vernonia, Klatskanie, Birkenfeld and Vesper. The false beginning of the Belding Road. The Belding road is an old logging road that descends way down to the Salmonberry River. No one I know (and that includes forestry types) have been down this abandoned road that crosses back and forth for 11 miles as it sinks nearly 2,500 feet in elevation down into the Salmonberry River Canyon. Belding Road descending into the Salmonberry canyon. Some people get a kick out of climbing up things. In my world the rivers run along the bottom of deep canyons and I’m always descending from above. Because the only roads out there are logging roads, they all lead too nowhere in particular. But they’re also everywhere – all along the ridge tops. Sometimes, to get out into the really remote rivers, you have to drive a labyrinthian route that unspools itself linking one ridgeline to another. Ridgeline roads built to carry heavy loads of timber snake out along the heights pushing ever outwards until the very last ridge has been traversed. The Belding Road is one of these sinuous and convoluted trails cut into the steepest slopes along the Salmonberry Canyon. It is both primally beautiful and terrifyingly brutal at the same time. Lidgerwood Roost – near the infamous Windy Gap. This close to the Coast the landscapes become fiercer: precipitous ravines with towering timbers growing off the cliffs. One of my favorite eyries is a place called Windy Gap. From there, on a good day, you can see the ships sailing up the coast. But when the gales came in 1955 this was no place for mortals. That winter it blew Lee Carrigan’s cabin right off the mountain. Tunnel 32 – note the bare rock above. the elk are hunkering down, and the Doug firs are clenching their roots. There is a promise of violence in the air that Coleridge would appreciate. In 2006, a gargantuan log jam blocked the Salmonberry River at Tunnel Creek. Caught in the tightly twisting canyon the river breached its banks and poured through the train tunnel. A roaring brown whirlpool swept back up the valley pulling the steep slopes down upon itself. I bet that by tomorrow when the first storms are due to hit, the river will churn once again. This once placid stream will be transformed, as the heavens open up, the storm roars up the canyon, and the syrupy brown water is whipped and churned with great chunks of wood and rock. As the storm intensifies the Salmonberry will froth and thrust forth great gouts of muddy water. Tossing rocks and limbs as much as 50 feet above the river, it will scour the cliffs of vegetation. Now can you understand why I want to descend the Belding Road to see the chaos at the end of the road? Finally, after eight years of exploring the nearly impenetrable wilderness that stretches from Scappoose to the Coast, it’s finally done and I’m holding a finished book in my hands. Not content with the long dusty hikes, I also worked my way through an immense collection of oral histories, old newspapers, railroad histories, logging chronicles and obscure newsletters to reprise 30 short stories that are offered alongside the 30 trails. I tried to make this more than just a hiking book. Where other guides concentrate simply on the route itself, this book also presents a collection of stories connected to these lonely places, the histories of their early explorations, as well as the fading Indian heritage. I’ve presented each trail along with its backstory so that you can appreciate the unique qualities of these otherwise silent forests. Besides, we all know about Oregon’s notorious weather, so some days are good for taking a long hike in our outback, but other days when the heaven’s are pouring down you can still enjoy this book. Light the fire and settle back to read the anecdotes that will just as effectively transport you to another time and place. The marketing announcement from OSU Press gives details on you can purchase copies directly from OSU Press. Otherwise you can also buy from Powell’s Bookstore (or their on-line store), or Amazon.com. Also keep you ears open for announcements here and elsewhere on readings that I have planned. Brief summary: This trail really goes to the heart of what led me to write this guide: the desire to find the truly beautiful places that exist way out beyond where most people will venture. This hike begins with a bone-jarring, but awe-inspiring drive that creeps along the edges of steep cliffs and reveals panoramic views into the fortress of mountains surrounding the Salmonberry River. It is a landscape that conjures up the presence of natural forces that are far from pastoral and quiescent. For me this “back way” down to the Salmonberry River is a very special experience. If you really want to get “out there”, this trail will take you there (and get you home, as well). Distance/Duration: From the Sylvan exit to the bottom of the North Fork Salmonberry Road is 54.8 miles. Just the portion on US 26 (from the Sylvan interchange to the “Section 10 Road”) is 41.3 miles or 45 minutes. The dirt road from US 26 to the end of the North Fork Salmonberry Road is 13.5 miles long. Expect that it will take you at least 1 hour and 30 minutes to complete. The footpath that descends along the North Fork of the Salmonberry River is only about 1.4 miles long and will take you 1 hour and 5 minutes to traverse. The total trip (one way) will take 3 hours and 20 minutes of travel time. Remember to add in rest stops and time to enjoy the river to your travel time. Depending on the condition of the road, I often park about a 20 minutes walk from the end of the North Fork Salmonberry Road. This portion of the road has several significant run-off gutters that cross the road diagonally, and can be challenging to cross without scraping the bottom of your car. Drive as far as your comfort level will permit, and consider unloading passengers to lighten the car. These precautions can add another 20 to 30 minutes to your travel time. That said, I have successfully navigated this rough road with a Honda Odyssey at least a dozen times, but “slick and muddy” conditions make me more cautions about how far I want to go…At a minimum plan for six and a half hours to get in and out, and back to Portland. From Portland to “Section 10 Road”: Head west on the Sunset Highway, and be sure to reset your odometer to zero as you pass by Exit 71B, also known as the “Sylvan exit” at the summit of the West Hills. From there travel 42 minutes or 41.3 miles to reach the “Section 10” road that diverges from US 26 on your left side. Should you miss this exit you can also take the Salmonberry exit, .2 miles onwards. The Section 10 Road is easier to spot since it emerges alongside Highway 26 and debouches into a wide gravel area on your left. The Salmonberry Road junction is harder to spot since it’s in a corner and the side road is not visible until you’re nearly through the curve – so go slowly if you miss the Section 10 Road. The “North Fork” is among the best Steel head streams in the country! From US 26 to end of the North Fork Salmonberry Road: Reset your odometer as you leave the highway since subsequent distance measurements are given in terms of distance travelled after departing Highway 26. We leave Highway 26 at the entrance to the Section 10 Road, at an elevation of 1585 ft. To get all the way down to the Salmonberry River will require navigating past two mountain ranges each approaching 2500 ft. in elevation and then descending down to the confluence at 760 ft. elevation. The route starts following Section 10 road, but this quickly merges with another access road (the Salmonberry Road), coming in from the right. From here on the road is designated as the “the Wheeler Road”. Keep following the Wheeler Road as it ascends the first heights. There are many smaller roads that connect to the Wheeler road, but you will want to stay on the central road (that shows the most use). After 2.68 miles (odometer reading) you will pass another road coming in from the right: Shields Road. Immediately thereafter the main road begins to descend and at 2.87 odometer miles you will enter an intersection referred to as Coyote Corner. On your left is a well-travelled road, which is the continuation of Wheeler Road. It heads east to Reeher’s Campground located behind Timber. But we will bypass this road and continue straight – now travelling along the “Wheeler Cut-off road”. At 3.66 odometer miles we encounter another connecting road (Shields Road – yes, this is the other end of the “Shields Road” that we passed a mile back) coming in from the right. Bypass it and immediately thereafter the Wheeler Cut-off Road starts to drop dramatically. Near the bottom of this steep hill the road begins to sweep around to the left. On the right side is a small forest road veering gently to your right. This is the continuation of the North Fork Salmonberry Road and can serve as an alternate route. But today we will continue to sweep around the corner where we are confronted by a three-way split. Using the aforementioned route, you will enter into the ridge top clearing known as Camp Nine from the a northeasterly direction. I recommend stopping here to take in the impressive views and to scope out the various roads leading out of this clearing. On your right is another road (Salmonberry Road) coming in from a northerly direction. Straight across the clearing (looking South) you will see three roads leading onwards. The middle one is just a short trail into the woods – long enough to accommodate a pick-up and trailer. Just to the right of the camping driveway is another road heading off in a southwesterly direction. This is the North Fork Salmonberry Road – and this is the route we will want to follow. The final choice, on the left, is the top of the Beaver Slide Road described previously. The afternoon sun filters through the forest casting a reddish glow. Follow the North Fork Salmonberry Road from this clearing. For two miles it traverses the southerly face of this ridge and then it makes a sharp U-turn and heads along the top of a south-facing ridge with stupendous views. Soon the road turns north and begins the long descent into the basin carved by the North Fork of the Salmonberry River. The road continues in this northerly direction for about 1.7 miles (from the U-turn). During this stretch you will encounter the first “run-off gutters” that will take patience to navigate (take them at an angle). At the 1.7 mile point (from the U-turn) the road swings around and begins to traverse the slope heading in a southerly direction. This last portion of the road can be challenging, so parking the car at this turn is not unreasonable. The final part of this descent is steep, rocky and drops precipitously as it winds its way .7 miles down to the base of the slope, just above the North Fork of the Salmonberry. In all, the trip from the highway to the bottom of the North Fork Salmonberry Road will take you about 1 hour and 25 minutes. This descent has been successfully traversed by my Honda Odyssey during the dry months of the year, but nonetheless it’s very difficult to navigate with frequent rocks and branches that need removing, and diagonal gutters carved into the road that require careful maneuvering to avoid damaging your car’s underside – not to mention retaining enough traction to climb the hill on the way out. The road gets rockier and the grade increases to more than 15% as you descend. It is quite sensible to park your car anywhere next to this road and complete the descent on foot – if you are not comfortable with the steepness and rough conditions. Such precautions are especially appropriate if conditions are wet or if you have passengers. Trailhead: The trailhead itself is a bit anti-climactic especially after crawling your way down the steep and rocky approach road. Yes, now that you’ve reached the trailhead you can unclench your hands from their death grip on the steering wheel! During hunting season it’s customary to find one or more hunters encamped in this remote location, but at other times of the year it’s quite deserted. The easily visible footpath leaves the open area on the left side (southwesterly direction) and heads southwards along the North Fork of the Salmonberry River. Trail condition: The trail is fairly rugged with lots of fallen trees to cross, and several areas where the path has been buried in fallen rocks – you have to pick your way through the rocky slope. At other places the river has eaten away the supports for the rail bed and you’re left clutching at branches as you try to cross the slippery slopes overlooking the river. The trail also crosses a number of streams that can be quite active in the winter and spring. The hike down along the “North Fork” is crossed by numerous little tributaries. Elevation change: The elevation loss experienced on the footpath leading directly to the main stem of the Salmonberry River is a negligible 240 ft. The toughest descent was accomplished in your car. Trail Log: The footpath down to the main stem of the Salmonberry River actually follows a rail spur that climbed the North Fork of the Salmonberry River. The original spur line terminated at the trailhead. The road that leads down to that point was added much later. Years ago, the southern end of the rail spur we’re following crossed the Salmonberry on a high wooden bridge that connected this spur to the main line of the Pacific Railroad & Navigation line, which ran along the entire length of the Salmonberry River. As we follow the old rail bed down and around a corner we are soon confronted with the damage wrought by a vengeful nature. At some places the rail bed has been buried by rockslides. At others it has been eroded to a whisper of a footpath. But in between you will find wide, level stretches of trail. And all along the way you’ll love the charming waterfalls that gurgle and leap their way down the valley. The hike down this valley always seems longer than the return. It’s probably due to the fact that I tend to forget the many different types of terrain we encounter along the North Fork of the Salmonberry River. Eventually, we turn the final corner and begin a gentle descent into a cozy sunlight clearing. This is a favorite stopping place for the hunters and anglers that seasonally frequent this area. Indeed, it was through reading an angler’s guide to Oregon rivers that I first learned of this provisional trail and the “easy” access it provided to the river. Confluence of the North Fork of the Salmonberry River and the main stem of the Salmonberry River. Entering into the clearing, I recommend that you walk to the southern edge where the lush grass ends abruptly above a cliff overlooking the river. It was from this elevated clearing that the original bridgehead crossed the river. To get down to the river, turn around and walk to the northern edge of the clearing. From there you will see that a small path leads west and wraps around a small knoll before descending down to the riverside. Loki’s Pool – where the North Fork meets the Salmonberry River. To cross the main stem of the river (during the warmer seasons of the year) I recommend turning left immediately after descending the final drop to the riverbank. To the left you will find a pool big enough to soak in, but also shallow enough at its lower end to cross on foot. On the other side climb the shelf of river rocks and head “upstream” , while at the same time getting closer to the heavily vegetated slope the separates the river bank from the forest growing above. There among the ferns and tree roots you will notice a track that leads up the steep slope. Look closer and you should find a rope dangling down the slick slope; use it to haul yourself up and into the forest above. Next on our agenda is to walk through the tunnel. This tunnel is relatively short so you can stumble your way through without a flashlight, but you would do well to come equipped with a flashlight. As we emerge from the other side of the tunnel you should note the sign that says “808”. Its significance is that the Southern Pacific, which owned this difficult stretch of railroad numbered all the tunnels to reflect their distance from the heart of the Union Pacific rail system – on Market Street in downtown San Francisco. So you are now standing 808 miles from downtown San Francisco! Right here is also where the Edwards incline incident occurred. Had you been standing here on that fateful day in 1928, you’d have been mangled beyond recognition. But luckily for all, no one was hurt even though the valley echoed with the impact of the fully loaded rail cars as they flew across the river and were obliterated as they struck the main line of the PN&R and the cliff face beyond the tracks. Read the anecdote on gyppo logging in Chapter 21 for the full story of this dramatic incident. Loki basking in the afternoon sunlight after swimming in his favorite pool. If you have time before the light fades, hike along the rail line. There are many more spectacular examples of what an angry river can do to massive rails and iron bridges along the way. To walk all the way down to the Foss Bridge from the 808 tunnel will take you another five or six hours. To walk the 2.5 miles upstream to the junction with the Beaver Slide road will take several hours because of the unusually heavy damage in this stretch of the river. As you plan your excursions along the main stem of the Salmonberry River remember to leave enough time to climb out of the canyon before nightfall! Remember there is NO WAY to call home from the bottom of this gorge to let them know you’ll be late – unless you carry a satellite beacon. It’s great news that this historic trail is being built, and that we have two state agencies leading the charge to get this trail fixed up and repaired to the point that it can be safely used. For more information on the changing status of the project watch for my reviews of the STIA meetings. Currently it is not safe to use!! It is not safe for people to hike or bike the Salmonberry rail line yet. Recently I heard that a family took a Padoodle out on the Big Baldwin trestle. The dog slipped between two ties and fell 180′ to the valley floor. The remains were not recovered since there was no safe way to descend to the bottom of the canyon. Help it become a trail first, then use it! Alternative hikes in the area include the Trail from Reehers Camp to Gales Creek, the Triple C Trail, the Standard Grade Trail (see Roger’s Peak Loop), Bloom Lake, the Four County point Trail and the Banks-Vernonia Trail. All of these trails are described on this website. Seriously, folks they’re planning to issue trespassing citations to thrill-seekers that ignore the no trespassing signs. If you have to see what’s at the bottom of this scenic canyon try using the road that descends down to the North Fork of the Salmonberry. I will post directions for the North Fork approach very soon. To reach the river, the Beaverslide Road approach is being discouraged because it descends over a tunnel and thus “crosses” the Port of Tillamook Bay railroad right-of-way. Hmmm, not sure whether this will be honored by those traditional 4×4 drivers that have used this access before…, or by determined pedestrians. I also highly recommend walking the Standard grade road that parallels the Salmonberry, only it’s at 2,500 ft in elevation with some tremendous views. It’s also great to bike (even with a street bike). You can reach it by climbing up the slope to the south of Cochran Pond. Just cross the RR tracks and keep climbing up the hill. One road leads to Bell Camp Road (ignore that one) and the other reaches a gated road – that’s the Standard Grade – follow it to the ridge top and follow it south as far as you want. I’ve ridden my bike all the way to Roger’s peak, but you can get all the way to Cook Creek (near Nehalem Bay) with lots of perseverance. I will post a detailed description of the Standard Grade trail shortly. It’s one of my favorites. You can also reach it by using Highway 6 and at the summit follow the dirt road that veers off to your right. Follow Storey Burn Road to it’s end – high on a ridge. Go past the gate and when you reach the ridge top about a quarter mile further you’ll see another road coming up the slope on your left – from Cochran Pond. On August 5th, the agency that was created expressly to handle the development of the Salmonberry Trail met near the Blimp Hangers in Tillamook. This was its third meeting and the agenda was weighty enough that even those fat blimps next door would be challenged to keep the progress aloft. True to form, I came equipped with my canoe and Zoe, whom I’d promised to take for a plunge in the Wilson River. I mean really, you have to have some less serious entertainment to keep one focused on the bureaucratic issues that dominated the agenda! New bylaws (developed by the PSU-based Oregon Solutions) were approved. Logo – one of the first grants was dedicated to the development of a logo. Seems a little like putting the cart before the horse, but why argue when they’re paying for the cart! Several early logo designs were on display. They mostly tried to convey the notion of a river coming out of a mountainous landscape. Nothing jaw dropping, but certainly they were sufficient to get the basic concept across. Rail ownership was a major topic, since “rail-banking” ultimately turns on the question of who will be responsible for the rail bed on which the trail will rest. Before we can get the OK from the National Transportation Safety Board (NTSB) to convert the use of this land we’ll need to agree upon the ultimate ownership of the RR alignment. Of course, the Port of Tillamook Bay (POTB) wants to be compensated for the rail alignment, but others insist that they were already compensated with FEMA monies after the flood of 2006. POTB says it has over a $ 1 million in rail-related debt that it would like to be compensated for. Undoubtedly, I’m over-simplifying…and the devil is in the details. A letter from the POTB to the NTSB was crafted and accepted by the STIA. This letter announcing the POTB’s intent to discontinue service starts a complicated process entailing predetermined periods of time within which public comment and agency responses establish a path to the ultimate goal of “rail-banking” the entire route. With respect to the ultimate transfer of ownership from the POTB to the STIA, it was decided that the POTB will bring a 3 person team to these negotiations, and the STIA will be represented by 3 different members (who don’t have obvious conflicts-of-interest). There was a review of the meeting in Timber which uncovered some strong local anxiety about the large numbers of thrill-seekers driving out to Cochran Pond and then walking onto the Big Baldwin Trestle. Dennis Wiley, the project manager reports upwards of 30 cars parked at Cochran Pond. “It’s gone viral”, he insisted. Conversations with hikers revealed visitors from as far away as Alberta. They were equally dismissive of any efforts to block access. “How long do you think that will last?” they retorted when it was suggested that the bridge access might be blocked off. Wheeler to Rockaway Beach – abuts estuary shoreline. Two very difficult spots. Rockaway Beach to Garibaldi – abuts estuary shoreline. Two very difficult spots. Garibaldi to Bay City – abuts Estuary Natural Zone, and Estuary Conservation. It is not safe for people to hike or bike the Salmonberry rail line yet. Help it become a trail first, then use it! Alternative hikes in the area include the Trail from Reehers Camp to Gales Creek, the Triple CC Trail, the Standard Grade Trail, Bloom Lake, the Four County point Trail and the Banks-Vernonia Trail. All of these trails are described on this website. The meeting also included some public input. Most of it concerned the disposition of the trail in relation to private parcels that abut the proposed trail. In anticipation of the announced discussion about trespassing and potential danger to thrill-seekers, the author emphasized that simply admonishing would-be visitors with a strongly worded caution about the illegality of trespassing was not enough. He suggested that signage be developed and placed at the Timber junction (US 26 and Timber Road) that redirected would-be visitors to other trails such as Reeher’s camp, the trail to Gales Creek, the triple C trail and other trails along US 26. The sooner that visitors could be cautioned and provided with alternatives the more likely it would be that they would divert from their original destination. Even at Cochran, the Standard Grade would be a suitable alternative, albeit a route that crosses private timber land. In addition, I suggested that the gravel road to Cochran be paved as far as Reeher’s camp to reduce the dust for Timber residents, and to reinforce the impression that Reeher’s Camp was the “end of the road”.